Beachfront villas such as Bela Vista are extremely rare. This spectacular villa has been refurbished to a very high standard. The villa enjoys a fantastic location directly above the beach with wonderful sea views, and is certainly a must for those seeking the very best in villa locations. The beach is accessed from the villa, via a gate and paved footpath that leads directly to a beach bar / restaurant, which is only a 2 to 3 minute walk. There are many amenities very close including a mini market and a good selection of bars and restaurants. Albufeira town is just 2kms, approx 30-minutes walk, but only about 15-minutes if you walk along the beach. The villa is located within a private cul de sac. The swimming pool is fantastic with a Jacuzzi and waterfall feature adjoining it. Imagine the parties one could experience here! Pool is surrounded by terraces with 8 quality sun-beds and a brick built Barbecue, poolside shower and a pool bathroom with shower. To the side of the villa there is a spacious lawned area, and the whole property is totally enclosed by walls and a gate. On the ground floor is the fully fitted fantastic kitchen with a breakfast table. The lounge and dining room had large patio doors opening onto the terrace with comfortable seating and dining furniture offering the most marvellous views. There is a lower ground floor with two bedrooms. 1 twin/double room and 1 room that has a bunk-bed and a single bed which has an additional pull out bed. Both these bedrooms share a shower bathroom. Also there are patio doors from the rooms on this level to the swimming pool terraces. On the first floor of the villa are 1 double with en-suite shower bathroom and a further twin/double with en-suite shower bathroom. 2-minutes walk to the beach.Albufeira town is just 2kms, approx 30-minutes walk, but only about 15-minutes if you walk along the beach, 40-minutes drive from Faro airport. Private Pool (6m x 4m with Roman steps) Heating £275 per week. Pool towels provided. Maid service. Weekly and mid week with change of towels. "Marvelous gem close to Abufeira"
Rented for 2 weeks with 3 other couples. Very comfortable and easy access to one of the best beaches in Europe. About a 20 minute walk up and down hill into town or the 'strip'. Beautiful ocean views and within earshot of the pounding surf. Just a note to say that the Villa was fantastic. It accommodated our family beautifully. As a holiday destination, Albufeira appeals to people of all age groups. Retired couples feel just as at home here as teenagers and families with young children. Albufeira is spread out rather than high-rise. The town itself consists of "old" and "new" sections which merge seamlessly into an extensive suburbia, spreading off back east along the coast to beaches at Balaia, Olhos d'Agua and Falesia, and west to Sao Rafael, Gala and the links golf course at Salgados. The whole area, greater Albufeira you could call it, is the largest tourist area in the Algarve, but people come here in droves and have the time of their lives. Albufeira started out at least 2,000 years ago as a small, fortified town which the Romans called Baltrum. Eight centuries later the Moors renamed it Al-Buhera. The Moors turned it into a prosperous port trading with North Africa. The Knights of Santiago led the Christian re-conquest of the town in 1250, but without its trade links Albufeira fell upon hard times and they lasted for hundreds of years. The old charm is still there, and it is to be found in the labyrinth of narrow streets, lined with whitewashed houses, restaurants, cafes and shops, which lead down the hillside to a central square, Largo Eng. Duarte Pacheco. The square is a good place to sit and watch the world go by. Nearby, next to the tourist information office, a tunnel at the end of a pedestrian-only mall leads on to the town's main beach. In the evening hundreds of people enjoy live music every night during the summer. Another section of this long beach is equally easily accessible from the streets leading off the other end of the square. There the beach is known as Fisherman's Beach and it's shared with sun-hardened men of the sea mending their nets. "New" Albufeira, centred on Areias de Sao Joao, is on the east side. Its most famous thoroughfare is affectionately known as The Strip. 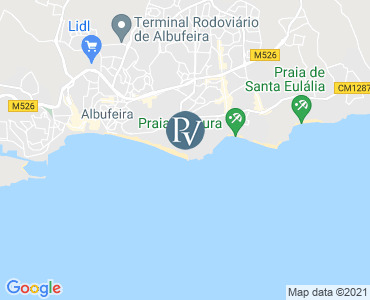 It stretches from the Montechoro Hotel, past scores of cafes, restaurants and bars, all the way down to a big busy beach called Praia da Oura. The Strip and nearby streets are a hive of activity from mid-morning, well into the wee hours the night.